To begin making the Goan Egg Drop Curry Recipe, grind together the ingredients meant for gravy except salt and oil by adding 1/2 cup of warm water. Add more water if needed while grinding. Ensure that the coconut is finely ground. Heat a kadai/wok, add oil. After the oil gets heated add 1 small chopped onion and saute until the onion turn soft and translucent. Add garlic, stir for a few seconds until the raw smell of garlic goes away. Once the curry is boiling, One one egg at a time and add it to the curry. Just break the egg above the gravy and drop it in the gravy carefully. Do this with all the eggs. Let the eggs get slightly cooked in the gravy. Add some hot gravy on top of the egg so that the heat of the gravy cooks the eggs properly. Once the eggs are cooked through, turn off the heat and serve. Serve the Goan Egg Drop Curry along with warm steamed rice, pickled onions and papad for lunch or dinner. In Goa, we make different types of curries to have along with rice. So when fish is not available, we make the egg-drop curry. This curry is made from eggs which are cracked and dropped in the spicy curry which is made up of grated coconut, onion, coriander seeds, dry red chilies, turmeric powder and tamarind. Addition of tamarind adds tanginess to the curry. The Goan Egg Drop Curry is easy to cook and takes just 20 Minutes. 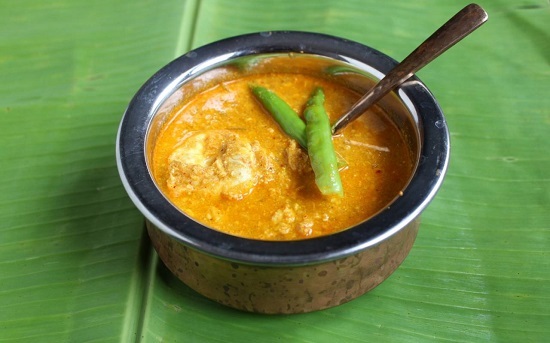 You can serve the Goan Egg Drop Curry along with steamed rice or have this with bread or phulkas.